Last night, A.J. Burnett was a mess. He couldn’t command his fastball or his curve, continually getting himself into counts where he had to throw a strike, and the Phillies took advantage. He gave up six runs in two innings and dug the Yankees a hole that they couldn’t climb out of. He was also pitching on three days rest for the first time all season. For many people, those two facts represent a causal relationship. Burnett struggled badly while going on short rest, so therefore, short rest caused the bad pitching. Unfortunately, life is never that simple. The usual critique against bringing a pitcher back on short rest is that his stuff won’t be as crisp as it usually is. Burnett, however, was throwing his regular gas last night. His fastball averaged 94.2 MPH this season, and he sat at 93.8 MPH in his brilliant game two outing. Last night, his fastball averaged 94.5 MPH. Same deal with his curveball – 82.0 MPH on the season, 82.3 MPH last night. 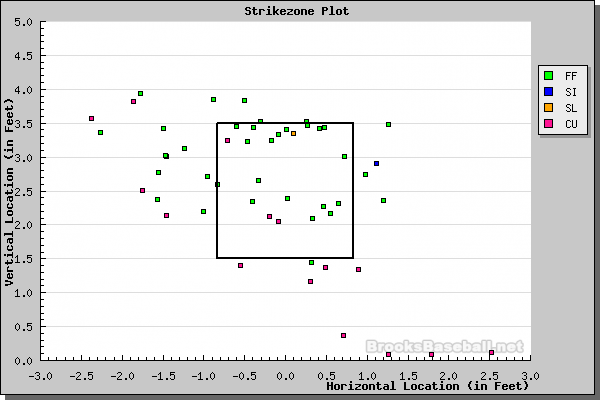 There are 16 magenta colored squares on that plot representing Burnett’s curveball. Eight of them aren’t even close, and only four of them were in the strike zone. It doesn’t matter how much movement you have when you miss the plate by that much. Hitters aren’t going to swing, you’re going to fall behind in the count, and all that’s left to do is groove a fastball. Command, not a lack of stuff, was Burnett’s undoing. Of course, there’s the possibility that Burnett’s inability to throw strikes was due in part to his altered schedule. However, that’s something we simply can’t know. Burnett is not exactly the model of consistency. In five different starts during the regular season, he gave up six or more runs. On April 19th, he walked seven batters, and he issued six free passes on two other occasions. And, of course, he got torched in the first inning by the Angels in the ALCS less than two weeks ago. He did all of that on regular four day rest. Consistent command of his pitches is never something Burnett has had, and he probably never will. He’s a guy with great stuff who doesn’t always pitch up to the level of his natural abilities. How much did the loss of one rest day affect Burnett? We don’t have any idea. Historically, he’s performed well on three days of rest, and his stuff was as good as ever last night. While Burnett did pitch poorly last night, and he was pitching on short rest, we simply cannot conclude that the latter was the cause of the former. It may have been, and probably was, some kind of factor. How much of an effect it had, we simply cannot know. We hoped you liked reading Burnett Struggles On Short Rest by Dave Cameron! If you want a fun, small sample of 4 games to back your case even more, Burnett has a career .572 OPS against on 3 days rest in the regular season. It doesn’t look like extra rest helps Burnett in his career, so maybe having to work on short rest once in awhile doesn’t hurt him either.